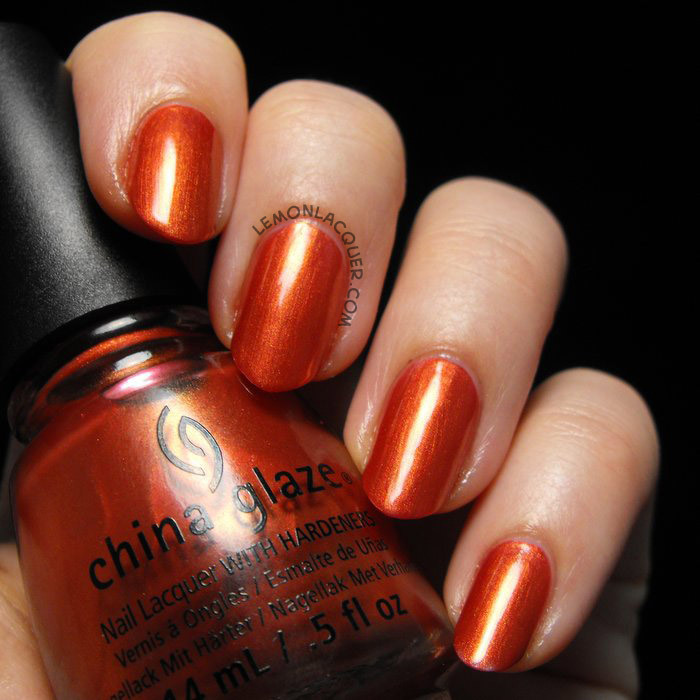 I love this orange leaning red shimmer, called Stop That Train! It’s a little thicker in formula than I like, but it’s definitely tolerable. I’m sure I would stop griping about it in my head if I just added a couple drops of thinner, but it’s definitely not required. This is two coats with top coat, and sadly, it does tend to stain a little. 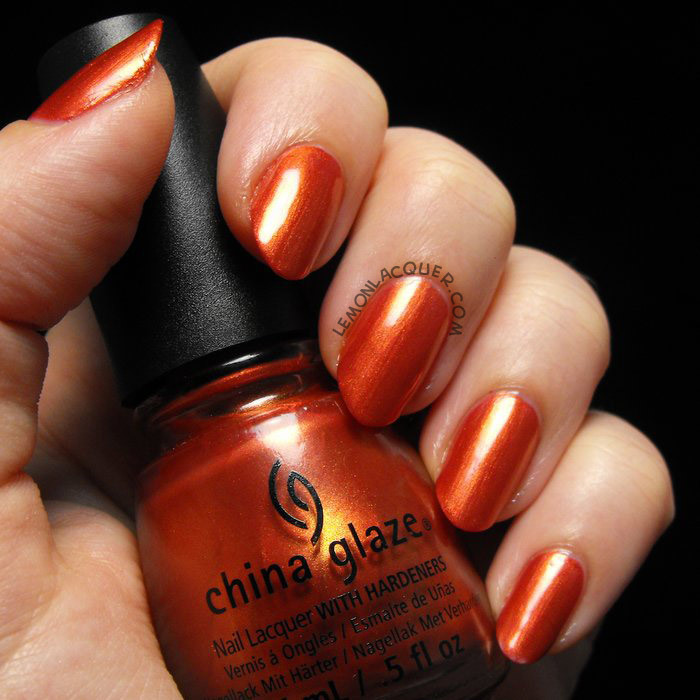 Double up on your basecoat if you’re like me and can’t help falling in love with the orangey shimmery goodness. This is Mind the Gap and it’s an odd shade of olive brown/green with beautiful blue shimmer (that likes to hide from the camera) in it. Earlier in the summer, I wore this for about three days and inspected my nails the whole time wondering if I liked it or not. Once I stamped some black over it, I decided I definitely liked it, but it was a pretty ugly colour, for sure. I’m still not sure I like it without something else to temper the oddness of it. 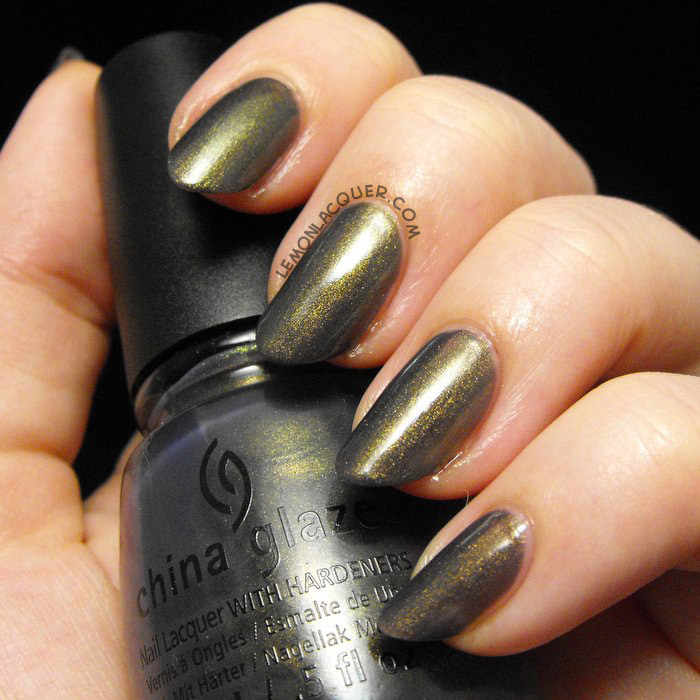 Keep in mind that this colour takes four coats for full opacity, plus a coat of top coat. It dries reasonably quickly, so it’s not too bad, but it does take a little time. I’m a big fan of dark brown nail polishes, and Lug Your Designer Baggage is no exception. It’s a creamy chocolate colour with gold flakes in it, and really gives the impression of vintage leather baggage. I only wish the gold flakes were a little more prevalent, so I like to wear this with a gold flake topper. This shade is a little draggy, so by gentle with your brush, and be patient. This is two gentle coats with top coat on all but the little finger which had a bald spot at the cuticle which required a third coat. The namesake of this collection is this demure dusty purple cream, called All Aboard. 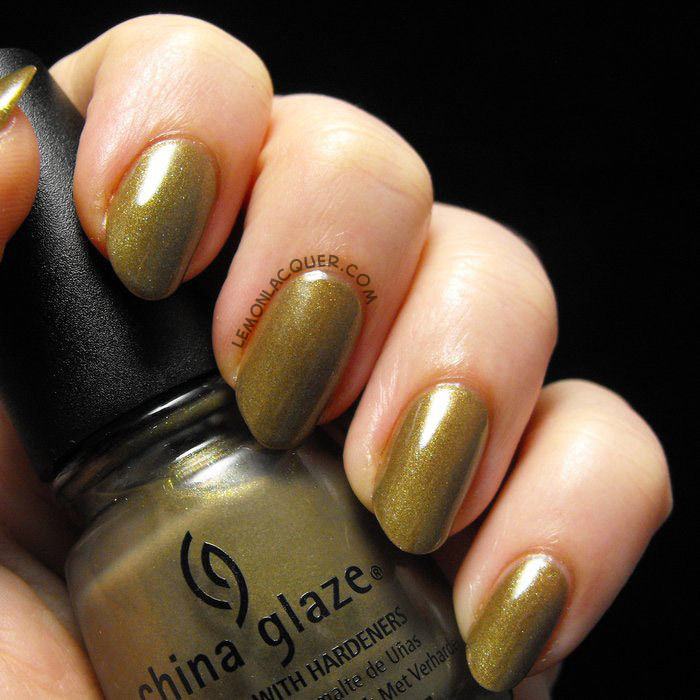 I like this shade, but it’s pretty self-explanatory and I am drawing a blank on clever things to say about it. This one’s a little draggy, but mostly opaque in two coats. If you look closely, you can see a few baldish spots near the cuticle on the index finger, and also the reflection of that bright pink shirt I was complaining about earlier on some of the other fingers.. 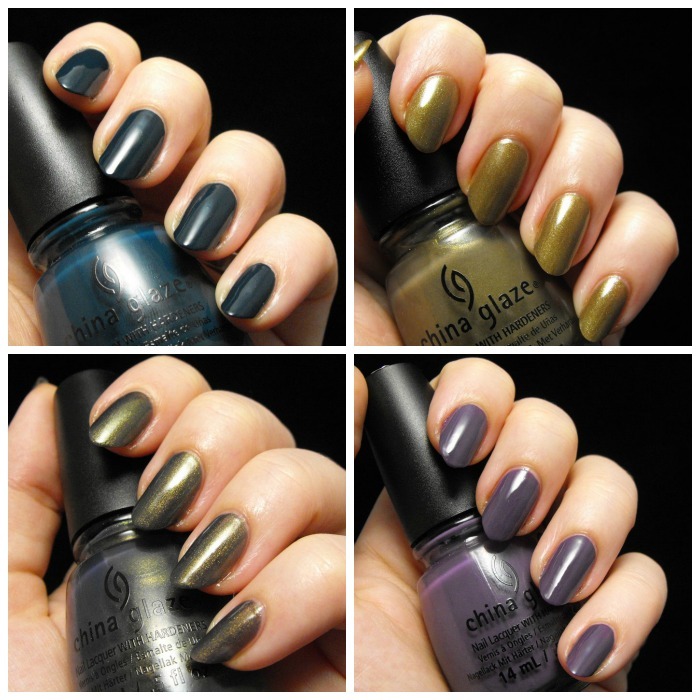 This gorgeous dusty blue/purple with gold shimmer is the bloggers’ darling this season, and it’s been touted as the must-have shade from this collection. I agree, honestly. Choo-Choo Choose You is a colour that is nearly indescribable, and I can never remember which drawer of the Helmer I’ve put it in. Is it blue? Grey? What about purple? I’m pretty sure it usually lives in the purple drawer, but it likes to hide from me. It takes at least 5 minutes for me to find this one when I’m looking for it, but I’m willing to put up with it because it’s so beautiful on my nails. This is two coats with top coat, and it’s ever so close to opaque, but there’s that nice bald spot near the free edge of my little finger, so in the future I’ll be using three coats for this one. Keep in mind that I tend to use really thin coats though, so if you tend towards medium or thicker coats, you’ll be fine with two. I feel like this one is similar to Mind The Gap, but it’s much more flattering on me. What Are You A-Freight Of is one of the two I picked up on clearance, and I’m so happy with both of them. This is a dark plummy mahogany that is decidedly warmer than black, and a nice choice for these colder months when you want something vampy but black is too stark and cold. The coverage is great with one coat, and it could probably be a one coater if you’re careful. This is two coats with top coat, and as you can see, it dries a few shades darker than the bottle. I’m a little sad about that, but it’s certainly not going to keep me from wearing it. Well Trained is my very first one coat wonder. It was opaque in one coat on all but a couple streaks on my little and ring fingers in bright light, but I got the hang of it quickly, and the rest of my fingers were opaque in one coat. My index and middle fingers show one coat, and the little finger, ring finger, and thumb are two coats. The thumb was opaque, but then I had an epic battle with my acetone jar and had to throw on a second coat. This is another one that dried darker than the bottle, but I am willing to overlook that because it’s so pretty, and it’s a one coater! I picked this one up on clearance, and I am thrilled that I did. 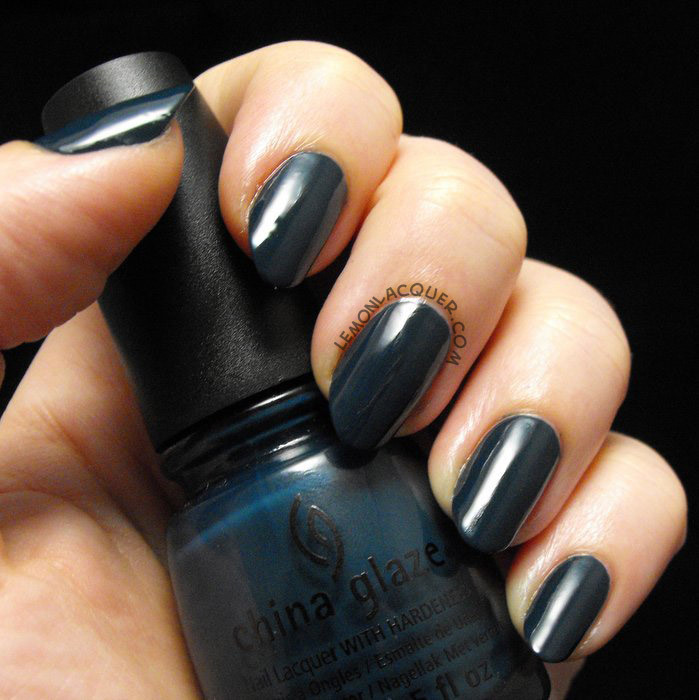 Run, don’t walk, to your nearest Sally Beauty to pick this one up if you like blackened blue-teals. This has topcoat, but I nearly forgot because it was so shiny with one coat. Do you have any picks from this collection? There are six more that didn’t float my boat, so am I missing any that you think are absolutely wonderful? Which one’s your favorite? Let me know in the comments.